Email is such a central part of the modern working life and one that occupies a lot of the one resource that will always be finite - time. We're passionate about building a sales CRM that banishes admin so you can focus on the most important thing for your business - selling. That's why email will always remain a key focus of Pipedrive's development. We’ve given users two ways to integrate their email, but we still felt there was still something lacking in our solution. What if a user is looking for a specific type of email? How does he or she find this in a sea of what could potentially be thousands of emails? Our new Email Filters let you pre-select criteria to get a specific view of your inbox. If you want to see only emails linked to deals, you simply apply that filter. You can even select multiple filters to really organize things. So say you want to see emails linked with deals that were not shared with your colleagues, have attachments and were sent directly to you, you simply apply the filters, click the button and see the results unfold. This will help you focus your attention toward finding that one email in your inbox, or dealing with a specific subset of emails. Let’s use a practical example. You’ve just returned from a well-earned, week-long holiday. You’re keen to get right into the swing of things but you have 120 unread emails. Just glancing at them shows a mixture of important ones, spam, newsletters, people offering you deals, bills and so on and so forth. Well, with the click of a button you can be looking at only emails linked to deals. Add another filter and now you’re only looking at deal-related emails addressed directly to you. Not a bad place to get started after a holiday, we’re sure you’ll agree. Email filters will be automatically enabled for all users and will work for both Smart BCC and Full Email Sync users. Go to your inbox now and start testing the filters. 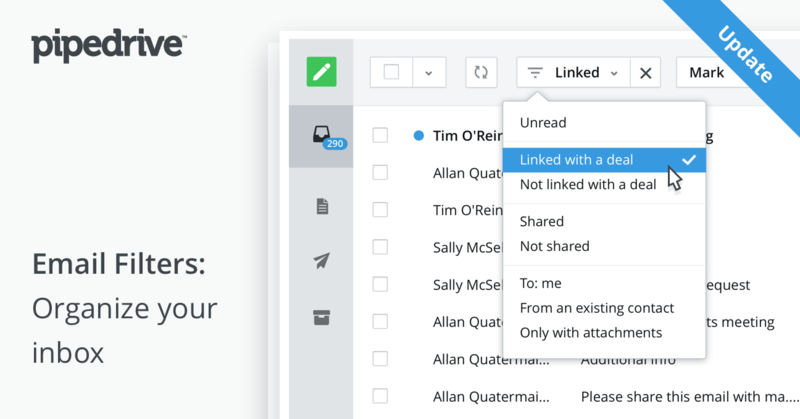 Watch this space for more email features coming soon.